Right after the show of Zarkoff's project Sumerian Fleet at the wonderful DECADENCE party on Saturday in Berlin Arena Club (where I met such wonderful folks & friends like Thea & Jasa from Degenerotika Fashion, Evilyn Frantic, Louis Fleischauer (from AMF Corsets), Miranda Trash, Hannah, Anne, Marta, DJs Steve Morell, Ben Bloodygrave & Necrophil, Model Sinteque and many more, not to talk about lovely new people I met that night) tomorrow Zarkoff will play a solo show at the Loophole Club in Berlin-Neukölln which will definitely be the place to be that night! shot by B.A.K.A. productions, the notorious experimental film collective from Croatia. A lo-fi journey into a bizarre summer adventure. Zarkoff (whose real name is Sasha Rajkovich) is a Croatian musician known for his solo work and several collabs, such as Florence Foster Fan Club (with Le Chocolat Noir), Sumerian Fleet (with Alden Tyrell and Mr Pauli) and various duos with female singer and musician Popsimonova (who has been introduced in this blog several times and took part in two of our STYLE! IT! TAKES! events already). 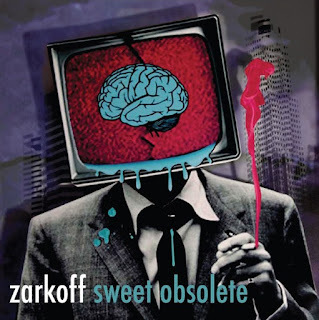 Zarkoff's solo output varies from techno to synth driven post punk and his latest album Sweet Obsolete even features prominent guitars. The album itself reached #1 on European Alternative Charts, staying there for 2 weeks. Apart from his own productions, he works as a mastering engineer for established underground labels such as Creme Organization and R Zone, and runs the Sensorium studio. Zarkoff opened the very first STYLE! IT! TAKES! event in summer 2012 in an unforgettable performance with stunning dancer & performer Clea Cutthroat (here's the beautiful live video of it, always worth to be seen again). 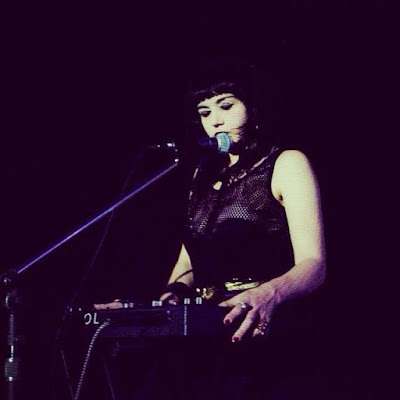 Also live on stage will be VV & The Void (Berlin/LA/Melbourne), a music project by lovely Valentina Veil, a musician, producer artist and curator living between Berlin, LA and Melbourne. Her music, often described as shoegaze, drone, noir, atmospheric, goth, neo-psychedelic, experimental is a celebration of opposite energies: grace and disproportion, feminine and masculine, moon and sun, birth and death, angel and devil, light and dark, conscious and unconscious. It surely will be a lovely evening with great concerts and - as far as I can see already from the Facebook-Event (opens in new tab) and other people who will be there - very beautiful, nice & lovely people in the audience. So, tomorrow night, the Loophole is the place to be in Berlin! Record review of a very beautiful limited release (Half Records) by POPSIMONOVA & ZARKOFF. In der griechischen Mythologie eine Rasse von Meerjungfrau-artigen Wesen und Meeresgöttern. Vorne ein männlicher Triton (Meeresgott), hinten eine weibliche Tritonin (Meeresgöttin), angereichert durch moderne Graffiti. In Greek mythology a race of mermaid/merman-like creatures. In front a male Triton (sea god), below a female Triton (sea goddess), enriched by modern graffiti. Gut übrigens, dass es keine lockenden Nixen sind, denn die wollen uns Menschen ja nur in den Abgrund locken, was im Falle des Weißen Sees keine gute Idee ist, denn trotz seiner überschaubaren Größe (etwa 300 Meter Durchmesser) ist der nach der letzten Eiszeit entstandene, also natürliche und trotzdem fast kreisrunde See mit einer maximalen Tiefe von mehr als 10 m eines der tiefsten Gewässer Berlins! Incidentally, it's good that they are not nixies, as these indeed often are only trying to lure us humans into the abyss, something which is no good idea in the case of the Weißer See as despite its manageable size (diameter is about 300 meters), the natural – but even so almost circular – lake originating from the last ice age is with a maximum depth of more than 10 m one of the deepest waters of Berlin! Suchbild: Wo ist der Hund? * Search pic: Where's the dog? "Eine idyllische Erholungsstätte für unsere Werktätigen bieten die Anlagen rund um den Weissensee. Neben schönen Parkanlagen mit vielen Bänken, Kinderspielplätzen und HO-Gaststätten ist ein Planschbecken mit Liegewiese vorhanden. Für eine Kahnpartie stehen bei einem Bootsverleih ausreichend Ruderkähne und ein Wasserrad zur Verfügung. In der Badeanstalt finden viele "Wasserratten" Gelegenheit zum Baden." "Unsere Kleinen tummeln sich im schönen Planschbecken." "Viel Vergnügen bereitet eine Fahrt mit dem Wasserrad." Wer Nachwuchs hat, kann die Kleinen auch heute noch im Planschbecken (in einem der drei Spielplätze des den See umgebenden Weißenseer Parks) bei den schicken wasserspeienden Seelöwen-Skulpturen (um 1920–25) von Willy Ernst Schade 'parken', nur leider können wir uns dann heute nicht mehr mit dem 'Wasserrad' davon machen, wie in der DDR der 1950er Jahre solche feschen Tretboote mit offenem Schaufelrad anscheinend genannt wurden (vgl. 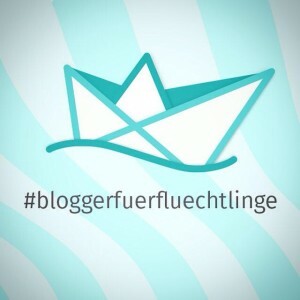 die Bilder und Original-Bildunterschriften oben). Aber Tret- und Ruderboote können nach wie vor beim Bootsverleih (werktags 14–18.30 h, Wochenende 10–18.30 h) am Ostufer ausgeliehen werden. Darüber hinaus gibt es auch eine Freilichtbühne mit Konzerten und Open-Air-Kino, eine Sonnenuhr und ein Damwild-Gehege. Trotz allem ist es am Weißen See selbst an sonnigen Sommertagen nicht so überlaufen und überraschend ruhig und chillig, was auch an dem angenehm gemischten Publikum liegen mag. Vermutlich aufgrund der vielen großen und alten Bäume (es gibt im Park 120 Jahre alte Walnussbäume, 130 Jahre alte Sommerlinden und 180 Jahre alte Rosskastanien) ist auch von den umgebenden Straßen nichts zu hören. 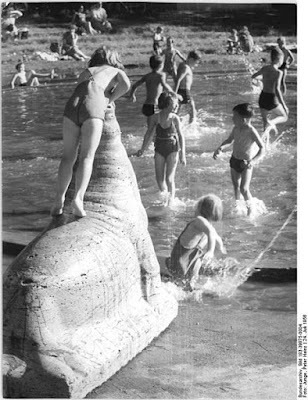 Those with offspring can 'park' the little ones till this day in the 'Planschbecken' (paddling pool) (in one of the three playgrounds of the Weißenseer Park surrounding the lake) at the chic water spouting sea lion sculptures (ca. 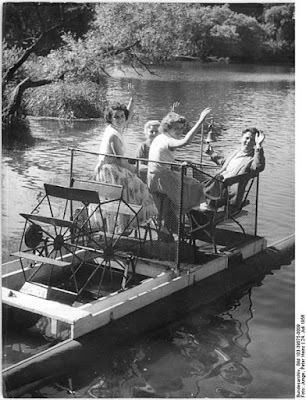 1920–25) by Willy Ernst Schade – only unfortunately today we can't slip away then with the 'Wasserrad' (literally: 'water wheel', but also 'water bike') anymore, how such smart pedalos (paddle boats) with open paddle wheel apparently were named in the GDR (DDR) of the 1950s (compare the black-and-white photos & original captions of that time above). But still you can lend both paddle and rowing boats at the boat hire (on weekdays 14–18.30 h, weekend 10–18.30 h) on the eastern lakeside. Further, there is also an open air stage & cinema with concerts and movies, a sundial and a fallow deer enclosure. Despite all that, even on sunny summer days it's not that overcrowded at the Weißer See and surprisingly calm and relaxed, which might be due to the pleasantly mixed visitors, too. Presumably because of the many big and old trees (in the park there are 120-year-old walnut trees, 130-year-old large-leaf lindens and 180-year-old buckeyes) nothing is to be heard from the surrounding streets, too. "Eine muntere Kahnpartie auf dem Weissensee." 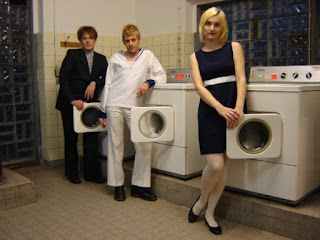 Sorry I'm really too lazy to translate that nice & funny German lyrics – everything you expect in summer! It's interdicted to interdict! * Il est interdit d'interdire! Im Gegensatz zu den 1970er Jahren und Problemen zu Anfang dieses Jahrtausends gilt die Wasserqualität des Sees nach verschiedenen Maßnahmen (der See wurde weitgehend von der verunreinigenden Regenwasserkanalisation abgeschnitten und wird nun über das Grundwasser mit Wasser versorgt) heute übrigens wieder als „ausgezeichnet“ (hier Details und aktuelle Messwerte, wer es ganz genau wissen will). Dafür, dass das auch so bleibt, kann – wie überall – jede und jeder selbst mit sorgen (Müll aufräumen, Hundebeutel mitnehmen, sanitäre Anlagen (leider nur im Strandbad) benutzen etc. ), aber das sollte eigentlich selbstverständlich sein. 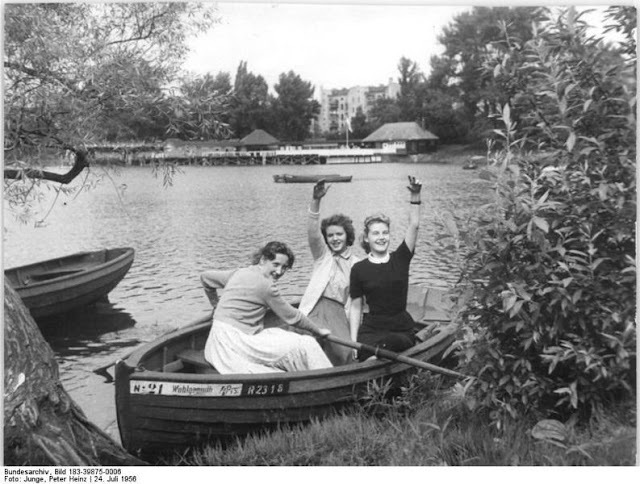 Badegäste stehen auf der Fontäne mitten im Weißen See. Bathers are standing on the fountain in the middle of Weißer See. In opposite to the 1970s and problems in the beginning of this millennium, it's said that after various actions btw the water quality of the lake today is „excellent“ again (here details for those who want to know it exactly). In order that it stays like this, everyone can take care for that themselves – like everywhere (clear the rubbish, take along dog fouling bags, using the bathrooms (unfortunately only in the lido) etc. ), but that actually should go without saying. Stoner girl* - Graffito an der Strandbar / at the lido. Rauchen ist erfreulicherweise überall erlaubt. Fortunately you can smoke everywhere. nicht nur gestern, sondern auch heute! es war schon immer so! hier gibt es nichts was Du vermisst! nicht nur gestern - sondern auch heute!" jeweils bis Berliner Allee/Indira-Gandhi-Straße, direkt vor den Park um den See. Ich liebe ihren Sommer-Style! ♥ I love her summer style! Euch allen einen wunderschönen Restsommer! A beautiful rest of summer for you all! + Die Photos unserer schönen Sommer-Events sind jeweils im Juli der vergangenen Jahre.